Asssam athlete Hima Das qualified for the semi-finals of the women’s 400 metre event at the 21st Commonwealth Games in Goldcoast, Australia on Monday. Yinka Ajayi of Nigeriaclocked 51.71 seconds to win Heat 5 while Botswana’s Christine Botlogetswefinished second with 51.73. Poovamma Raju, the other Indian in the fray, crashed out after finishing fifth in Heat 1. 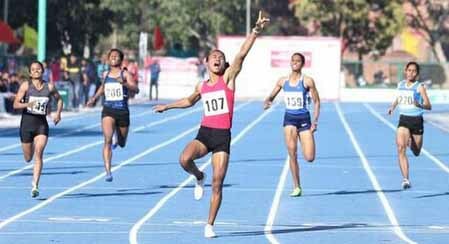 Poovamma clocked 53.72 seconds to finish 0.175 seconds behind Botswana’s Amantle Montshowho registered 51.20 to take the top spot in Heat 1. Anastasia Le-Royof Jamaica clocked her season’s best time of 51.37 seconds to take the second spot. The top four in each of the four heats earn a direct spot in the semi-finals while the next four fastest runners are also allowed to advance. Poovamma’s timing was not enough to earn her a berth in the next stage, reports Business Standard. Apart from Montsho and Le-Roy, third placed Emily Diamond(52.26) of England and Zambia’s Quincy Malekani (52.40) also entered the semi-finals from Heat 1. Former world champion and 2016 Olympicssilver medallist Stephenie McPhersonof Jamaica had the overall fastest timing in the Heats stage with 50.80 seconds.